Slavery Begins with the Mind. An Essay on Propaganda. A little history of Gurus. Those gurus, they’re off the charts when it comes to deadly sins, for they will rob you of your most precious thing, and that’s your self possession. – A serf. Born in 1891 to Jewish parents, Edward Bernays was the nephew of Sigmund Freud, pioneer of psycho-analysis and the important role played by the subconscious in human behaviour. Named by Life Magazine as one of the 100 most influential Americans of the 20th century, Bernays adopted his uncle’s ideas to develop techniques of persuasion to influence public behaviour, writing in one of his books regarding opinion moulding, or what he called engineering consent, that ‘If we understand the mechanisms and motives of the group mind, is it not possible to control and regiment the masses according to our will without their knowing about it? The recent practice of propaganda has proved that it is possible, at least up to a point and within certain limits.’ E.Bernays. ‘Propaganda.’ (1928.) Brooklyn, N.Y. P47. ‘The conscious and intelligent manipulation of the organized habits and opinions of the masses is an important element in democratic society. Those who manipulate the unseen mechanisms of society constitute an invisible government which is the true ruling power of our county… We are governed, our minds are moulded, our tastes formed, our ideas suggested, largely by men we have never heard of. This is a logical way in which our democratic society is organized. Vast numbers of human beings must cooperate in this manner if they are to live together as a smoothly functioning society… in almost every act of our daily lives, whether in the sphere of politics or business, in our social conduct or our ethical thinking, we are dominated by the relatively small number of persons who understand the mental processes and social patterns of the masses. It is they who pull the wires which control the public mind.’ (1928 ) PP 9-10. Bernays is presenting here a distorted view of democracy that subverts both its social basis in the free actions of individuals and its governance basis by way of non-arbitrary rule of law for all its citizens. And in the techniques and programs he employed, you can gauge for yourself how far from ‘noble’ were Bernays’ public relations’ practices. When he started working for American Tobacco Company, Bernays was given the objective of increasing Lucky Strike sales among women, who for the most part had formerly avoided smoking. The first strategy was to persuade women to smoke cigarettes instead of eating. Bernays began using photographers, artists, newspapers, and magazines to promote the special beauty of thin women. Medical authorities were found to promote the choice of cigarettes over sweets. Home-makers were cautioned that keeping cigarettes on hand was a social necessity. The campaign was a success but a taboo remained on women smoking in public. Tying the smoking campaign to the women’s freedom movement Bernays organized a contingent of attractive women to smoke cigarettes, ‘torches of freedom,’ in the 1928 New York Easter Parade. The carefully scripted event was a publicity success and women across the country were soon smoking as planned. The United Fruit Company hired Bernays in the early 1940s to increase banana sales which he did by linking them with good health and placing them in the hands of celebrities. But then he went further, orchestrating political propaganda in concert with the US government to facilitate the overthrow of the democratically elected president of Guatemala, Jacabo Guzman, who had begun land reforms including buying back land owned by the United Fruit Company. Under previous governments the U.F.C. had acquired ownership of 42% of the land and was exempt from paying taxes and duties on exports. Bernays’ campaign resulted in having Guzman replaced by someone more acceptable to the United Fruit Company. So when you wish to make BIG changes you have to be persuasive. Here’s another guru, Plato writing his plans for the utopian Republic he hoped would replace Athenian Democracy, a Republic in which all change would be arrested. The rigid caste system that Plato designed to achieve his static society necessitated his myth or necessary ‘noble lie,’ of the metals in men, gold in an elite class who should lead, and beneath them, tiers of inferior metals with their ordained, unquestioned roles of obedience to the philosopher king. In this hierarchy, only the gold elite get education, but it is an education of received truths not to be questioned, and Plato hopes that in time even the philosopher class will come to believe his noble lie. More dishonesty. Plato used Socrates as his sock puppet to give respectability to his totalitarian program. Socrates, advocate of the open society and critical debate, no longer around to speak for individual autonomy, becomes the mouthpiece for Plato’s authoritarian doctrines. Here, on justice and rule of law, Plato has Socrates giving a whole new meaning to words like ‘justice’ or ‘freedom’ via convoluted argument … What means justice for each citizen? Why, it’s the right to possess what is his own. And what is this right specifically? Why it’s the right, (within the imposed caste system) to attend to his own business, that is, the right of the labourer to labour, and presumably of the slave to slave. So much for justice. Hegel promotes his historicist doctrine by a dialectical method that is an assault on logic. While criticism and science proceed on the argument that contradictions are impermissible and attempts must be made to eliminate them, Hegel argues that since science progresses via contradictions, contradictions are to be welcomed and there is no need to eliminate them. What Hegel is doing is omitting part of the argument that contradictions could be said to be welcome only as a means of identifying and eliminating false arguments and theories. By eliminating the italics part of the argument, Hegel focuses on the connotation of welcome as inviting to stay as a welcome guest. By such sophistry, all criticism and argument, important in arguing our freedoms, must cease, as also attacks against Hegel’s own philosophy. And by conflating liberty with control, employing smoke and mirrors language as pseudo demonstration, therefore and therefore and therefore … to undermine human freedoms, Hegel uses a pun on liberty to show that a liberty is the same as a law, from which it follows that the more laws, the more liberty. Propagandists past and present? There’s moah! Dr Joseph Goebells, propagandist extraordinaire of Hitler’s ‘Blood and Soil’ war machine, master of emotive slogan campaigns and imitator, or so Edward Bernays was told, of the persuasive techniques of Bernays himself. Joseph Goebells used Bernays’ book, ‘Crystallizing Public Opinion,’ as a basis of his propaganda tactics to demonize the Jewish population and carry out a genocide campaign against them. Dr Goebells, epitome of guru Dr Evil. Today, there’s one, George Soros, who wants to do away with the nation state altogether and run a globalist state governed at a distance by unelected technocrats like himself, and by golly he’s got the money to do it, lots of dollars to fund campaigns to destroy western institutions from within. Soros’ campaigns include education ‘occupy their heads,’ training social justice warriors and a campaign to promote illegal immigrants’ right to vote. Activist bodies and groups are given grants by his ‘Open Society Foundation, ‘Open’ only in reference to untrammelled immigration, much of his funding of violent protest groups like Rise Up Org and Antifa, is more discrete but has definitely been traced to indirect and backdoor payments. Like those other smoke and mirror gurus, Soros likes to flout the laws of logic. While Soros, in his ‘Open Society’ (2000) manifesto admits that the Enlightenment unleashed the creative energies of the human intellect to bring about achievements and living standards ‘beyond compare,’ he then dismisses these achievements ‘beyond compare,’ by arguing that in the Enlightenment ‘Reason was unequal to the task.’ As an historical illustration he cites the excesses of the French Revolution, not an applicable example as participants in the French Revolution abandoned constitutional safeguards and rational behaviour, instead responding to events by leadership fiat-decision-making and mob-rule. What does it mean, ‘subject reason to ‘reason,’ subjecting reason to itself? And what does it mean to ‘enter the age of fallibility?’ Would not our ‘human fallibility’ require us to act by trial and error-testing, which is rational behaviour for a fallible being and also the objective basis of the scientific method?. What Soros says here is illogical, he’s putting fallibility in place of reason. By abandoning reason, where does that get us? Well it gets us just where gurus want us, amenable to propaganda slogans modelled on George Orwell’s 1984, you know, slogans involving double – think, like ‘War is Peace.’ ‘Freedom is Control.’ ‘Truth is Lies.’ Can’t have a rational populace alert to the contradictions gurus employ to get control of their minds. So how come a procession of dastardly gurus are motivated to control the rest of us cits, and how come they so often succeed in their machinations? Seems it’s there in the wiring of the homo sapien brain. Remember this little scenario in Alfred Hitchcock’s film, ‘The Birds’? Who are you? Well, you have only to look at that famous image of ‘The Ascent of Man,’ to see that descended from the gods we are not. Has to be that a large measure of what we do is determined by our genetic inheritance, from lizard brain to our evolution by way of our early mammalian ancestors. What are you? Bright side, dark side, let’s do dark side first. Says Daniel Kahneman in his book, ‘Thinking Fast and Slow,’ ‘We are machines for jumping to conclusions.’ That’s pretty much it, says Kahneman, a psychologist who turned psychology into quantitative investigation. Daniel Kahneman argues the existence in our brains of two independent systems for organizing knowledge, one he labels System One, a fight or flight survival mechanism which probably evolved with our ancestors, the lizard brain, a fast thinking system making judgements and taking action without waiting for our conscious awareness to catch up. Making use of memories and heuristics linked with strong emotions like fear and pain, though the fast thinking system worked well for fight or flight survival in a jungle, its judgements are often wrong. Our System Two is the slow process of forming judgements based on conscious thinking in the frontal cortex that checks the actions of System One and allows us to correct our mistakes. For System One thinking, says Kahneman, the measure of success is coherence of a story, consistency, not completeness of evidence… ‘what you see is all that there is.’ To answer difficult questions there’s a grab-bag of simple heuristics we adopt to make adequate but often wrong answers to difficult questions like ‘the availability heuristic, what comes readily from memory, first in line.’ And the bad news is, as Kahneman first discovered, working with Israeli Defence Forces in the 1950’s, that your System Two thinkers are also prone to similar thinking errors and heuristics, more apologist than critical of the emotions of System One. And something else runs counter to individual decision making regarding that early inheritance. Homo sapiens evolved as social animals in family groups and tribes that developed within a web of culture. The individuals who made those hand imprints on the walls of the Lascaux Caves were also part of a group, as we, members of tribes, associations, nations, live in societies with pressures to conform according to accepted rules and mores. Throughout history, some cultures have emerged that are more enabling to rational thinking than others. Compare the tribal society of Sparta, where institutions were seen as god given and unalterable, to the emerging democracy of Athens, 5th century B.C. where its citizens dared to question what and how? Being a member of a maritime society is helpful, observing many cultures and recognizing that institutions are made by man and therefore may be changed. Greek tragedians, Sophocles and Euripides, writing drama about political and social problems, Greek philosophers, Socrates and Aristotle, Socrates developing critical argument, Aristotle developing tools of logic, ways of recognising and eliminating contradictions that hinder enquiry, these were major steps for human kind. Evolutionary nature has endowed human beings with dexterous hands with opposable thumbs, big brains, language capacity beyond signalling, all of which curious humans, wanting to solve a problem have exploited to the max. Man the creator, achievements in the arts, Shakespeare exploring in iambic pentameter, possibilities of dramatic language and cognition, giving us characters thinking out loud, whether to themselves or to others, reflecting on what they themselves have said, and in the course of reflecting, becoming a different kind of character. In the visual arts, Greek, 6th to 4th century B.C. vase painters and sculptors and Renaissance artists, Leonardo and Michelangelo, exploring ways of suggesting depth of field and movement on canvas, and in stone statues, as in life, suggesting muscle and living tissue. Music composers, Mozart, Beethoven and ‘Song of Man,’ Johan Sebastian Bach, creating out of sound bits, complex orchestrations and miraculous harmonies of song. Man the discoverer, those curious investigators of the scientific revolution, persistently seeking real answers to nature’s mysteries … Galileo, Isaac Newton, James Hutton, Charles Darwin…. Great movements in civilization by way of individual and opportunist endeavour. Opportunistism, every living thing must do it, find and explore new opportunities, new skills, new niches, live to fight another day – that’s the Darwin Award for doing it right. ‘Why can’t we?’ ‘The Sun Also Rises.’ Ernest Hemingway. … Well actually we can. So let us begin… Aristotle’s three laws of logic are your key to fight-back, and of course, shown by history, individuals from Socrates and Galileo to Darwin, a felt need to get it right as the spur to real engagement with nature, of which we are a part. First law of logic is the Law of Identity. A thing is what it is and is no other thing. As in the logic of mathematics, 1=1, does not = 2 or = 3, so in reality of nature, a thing is itself and not some other thing, A=A, can’t be B or C.
Gurus need to mess this up. It’s the art of persuasion. If they’re going to convince their focus group that ‘lies are freedom’ or ‘ignorance is strength,’ they have to subvert the Law of Identity by sleight of hand, word-craft mis-definition and drum in the identity switch by forced association and oft repeated slogans…Gurus understand that habit rules. of a symbol – conjuring trick. Definitions again: ‘Truth: an idea that cannot be contradicted by any other implication within its context.’ Truth in logic, as in nature, is one of two possible states, the other possible state is false. and at the same time. Clevah! Aristotle’s Law of the Excluded Middle. The Law of the Excluded Middle: a statement has to be true or it is false, it’s a binary opposition. If a statement does not evaluate to ‘true’ or ‘false,’ it is, by definition, unreasonable. Truth in logic, as in nature, is one of two possible states, the other possible state is false No other option such as ‘maybe, could be, should be. Gone are problems like the liar’s paradox, designed to confuse and weaken you, if part of a statement is untrue, the statement is false, that’s it! And if a description can’t be substantiated, then it doesn’t exist, no such thing as an empty set. This eliminates the mysterious and the superstitious in one fell swoop. Shakespeare wasn’t wrong when he said that’ nothing can come of nothing.’ H/t King Lear, Act 1. Negation of nothing is nothing: ‘I did not destroy New York today,’ does not mean that I built anything. The negation of life is nothing The negation of death, is nothing. Life after death, well you know… Better make life count and guard your precious self possession, don’t let those gurus take it from you. Law of the Excluded Middle. of fear and guilt, any size, as required. Well that’s about it! Reconstituting reality requires truth as a casualty, and every guru from wa-a-ay back KNOWS the so called ‘noble’ lie is a necessity, by raison d’etat, and ‘the state is us’ and we know what is best for you and we know what is best for us. A serf’s musings on climate science. So if it can’t or won’t agree with observation, if it’s gigo –garbage in and out, then no matter how beautiful the model, it’s wro-ong. Can Nature be subdued to art’s constraint? Her smallest fragrant is still infinite! And so he paints but what he likes in it. What does he like? He likes, what he can paint. And so, herewith, via writings by Professors’ Richard Lindzen, Ross McKitrick, W.J.R. Alexander and Judith Curry, identifying problems with climate models, a serf’s musings on why those climate models, however beautiful they may seem, are fatally flawed. A little history of science change. Richard Lindzen, in his paper, ‘Climate Science: is it currently designed to answer questions?’ (2008) looks at reasons, why climate science won’t, and does not, seek to describe Nature faithfully…namely, as a consequence of 20th century politicization of science generally, and of climate science modeling specifically. Enter Government, stage left, with customary dead–hand effect. Richard Lindzen traces the ways in which science has changed from its traditional practice involving ‘the creative opposition of theory and observation wherein each tests the other in such a manner as to converge on a better understanding of the world.’ (P2) He identifies, in the aftermath of WW2. a shifting paradigm from ‘gratitude’ for the achievements of science during the War and in the ensuing two decades, with the lessening of new discoveries, change to a new paradigm for the science community in the late 1960’s, a paradigm of ‘fear,’ fear of the Soviet Union, fear of cancer, etc. Lindzen observes that ‘fear,’ as an incentive structure for big government spending in science and expansion of bureaucratic structures for stakeholders, is more compelling than gratitude. Some consequences of fear as a basis of support. With the end of the Cold War, there arose a need to look for other fear incentives, which soon put the focus on the environment. Enter, also left of stage, your Anthropological Global Warming, Climate Incentive… Climate Change Science, here’s a small and immature field of science depending on fear-based support, which makes it particularly vulnerable to fear-based corruption. Richard Lindzen points to ways this is actually taking place in climate science. One consequence of the big spending paradigm in science appears to be that less emphasis is given to theory, because of its intrinsic difficulty and small scale, and more emphasis, instead, is on model simulation, (which calls for large capital investment in computation) and emphasis on adoption of large programs unconstrained by specific goals. More to be gained by perpetuation of problems than by solving them. This politicization process, exploiting public alarm, necessitates political corruption of scientific institutions, as it requires political spokespersons on message within the expanding academic, government and research organizations that support science. Bringing data into agreement with the models. And more on that hockey stick here, in a paper by Professor Ross McKitrick. Ross McKitrick’s paper, ‘A Brief Retrospective on the Hockey Stick’ (2014) is a concise summary of the controversial MBH98 paper and the methodological problems that McKitrick and Steve McIntyre identified in Michael Mann’s creation of that iconic hockey stick. Worth reading in the original, linked above, its analytical explanation is only six pages long, and clearly formatted in six sections. 1: Core Issues: The Proxy Data set. Those suspect tree ring records, namely bristlecone pine cores from high mountains in the US Southwest. These long-lived trees grow in highly contorted shapes as bark dies back to a single twisted strip. The scientists who published the data specifically warned that the data should not be used for temperature construction. Mann’s method exaggerated the significance of the bristlecones so as to make that chronology out to be the dominant global pattern rather than a minor and regional one. Mann understated the certainties of the final reconstruction leading to the claim of 1998 s the warmest year of the last millennium. Mann put obstacles in place for subsequent researchers wanting to obtain his data and replicate his methodologies, six years later were only received by the intervention s of US Congress ional investigators and editors of Nature magazine. 4: The National Academy of Science (NAS) Report. : McKitrick describes how Gerald North et al came up with elliptical ways to actually say that the Hockey Stick was unreliable … reductions can be assessed in a variety of tests … if the Coefficient of Efficiency (CE ) score is near zero or negative, your model is junk … the Wahl and Amman paper in which they use Mann’s data and code and compute the test scores that he didn’t report The CE scores range from near zero to negative … telling us that Mann’s results are …well you know! W.J.R. Alexander, Professor Emeritus, Department of Civil and Bio-systems Engineering at the University of Pretoria, published a report, ‘A Critical Assessment of Current Climate Change Science, (April, 2006)’ which I downloaded for my files in 2011. The report is an impressive and fascinating study of sunspot observations and their correlation with flood data of the River Vaal, and the report is also a critique of climate science and bodies like the IPCC for their reluctance to make use of the extensive hydrological and historical observations available to them in the South African data base. ‘Tis Unfortunate that Google no longer provides connection to this paper or several other publications by Professor Alexander, one wonders why, as Professor Alexander brought a wealth of experience to water research and management, so here is a link to a shorter publication by Alexander which I located at R Pielke Senior’s blog and which includes in its Tables 9-10, (on pp 23/24 of the original paper ) observations important in the much longer report. Regarding that wealth of experience: in his early career Professor Alexander spent years in the field building dams, canals pipelines and the Orange-Fish Tunnel, which is the longest tunnel in the world. Later, as Chief of the Division of Hydrology he was responsible for collection and publication of hydrological data and conducting research necessary for water resource management in a water-scarce country and designing structures exposed to flood damage. A major challenge for Professor Alexander was the search for multi-year river flow prediction capabilities and solving this problem was motivation for his continuing research when he was appointed Professor Emeritus at Pretoria University in 1985. This research reads like a detective story. Not jest an academic enquiry but a real need. Lot’s of prior knowledge of the multiyear characteristics of rainfall and river flow in the historical record. In the 1900’s there’s scientist, civil- engineer, R,E Hutchins who served in the British Colonial Office in India during the severe drought of 1876, at the time searching for predictable links between droughts and sunspot numbers. When Hutchins migrated to South Africa he continued his research, finding a correspondence between average price of food grain and sunspot numbers and showing that the linkage between floods that broke the drought and sunspot numbers was greatest in the temperate zones, not the tropics or northern America or Europe. Following Hutchins, in 1950, civil engineer R.E Hurst, analysing 1080 years of data recorded on the Nile River in Egypt in order to determine the required storage capacity of the proposed Aswan High Dam, found an unexplained anomaly in the data. Using graphical methods he recognized the same phenomenon in the long record, which became known as Hurst’s Ghost and which was confirmed by Mandelbrot and Wallis, in their paper.’ Some Long-Run Properties of Geophysical Research,’(1969) finding the anomaly present in their own extensive research of varve deposits, river flow and meander, earthquake frequencies and sunspots. In the mid 1970’s hydrologists in the South African Department of Water Affairs also encountered Hurst’s anomaly, and perceiving that the reservoir capacity–yield model was deficient, began looking further. Graphical analysis revealed that there was a clear 21 year periodicity in the data that was the cause of the difficulty. These graphs showed a clear pattern in the accumulated departures from the record mean values that were approximately synchronous with sunspot activity. Over the following years, Professor Alexander continued studying Vaal River periodicity and in 1995 Published his paper ‘Floods, droughts and Climate Change’, in which he successfully predicted the next breaking of the drought. In November 2005 Alexander issued another flood alert, which was again a successful prediction. From his examination of sun spot cycles available from the World Data Centre for the Sun spot Index, Professor Alexander observed a pattern, not apparent in the conventional graphs a pattern that that did not appear in the 10.5 year sunspot cycle but via alternating pairs of year cycles where there is a meaningful difference in sunspot activity in the alternating cycle of the pair. What is important is not annual sunspot density but rate of change in the densities. Herewith his graphs that illustrate the process. The Figure 9, below, is very important demonstrating the unequivocal synchronous relationship between annual sunspot numbers and the annual flows in the Vaal River that is South Africa’s major river. Note the alternating above (rising) and below (falling) flow sequences and their synchronous relationship with sunspot numbers; also the statistically significant (95%), 21-year periodicity in the flow data synchronous with the double sunspot cycle. Notice the absence of 11-year periodicity in the correlogram of the Vaal River. It is no wonder that climate change scientists have been unable to detect synchronous relationships with the 11-year sunspot cycle. It does not exist! This is because the properties of the alternating solar cycles are fundamentally different to the extent that the climatic responses are also very different. Figure 9. Comparisons of the characteristics of annual sunspot numbers with corresponding characteristics of the annual flows in the Vaal River. Another frequent error associated with the sunspot cycle is the assumption that the maximum effect is associated with the sunspot maxima. This is altogether wrong. The maxima occur immediately after the solar minima. ‘Unfortunately,’ says Professor Alexander, ‘this process is fundamentally flawed. The interest is in climate change. Climate in turn does not refer to an instant in time but to a period of time. For example, agricultural and water supply droughts have durations measured in years. The interest is therefore in the properties of future multi-year time series, not in changes in mean conditions. Global climate models are inherently incapable of producing information in this format. Contra to the IPCC statement of complexity preventing extrapolation of past trends, statistical or purely empirical techniques, ‘more than 3000 years ago, administrators in the ancient Egyptian civilizations were aware of the anomalous grouping of wet and dry sequences of wet and dry seasons and the ability to predict future conditions,’ which the IPCC denied. And there’s that record from the water level gauging structure on the Nile near Cairo, the longest hydrological record in the world, which the IPCC ignored. Following Nature? No way, what has Nature to do with us? In a post at Climate Etc, November, 2016, Professor Judith Curry presents a critical analysis of climate models with some follow up insightful commentary by readers.. Read the full post above, which addresses the following four questions: (1) What is a Global Climate Model? (2) What is the reliability of climate models? (3) What are the failings of Climate models? (4) Are Global Climate Models’ a reliable tool for predicting climate change? Here’s a summary of Judith Curry’s analysis paper, ‘Climate models for lawyers,’ as a response to each of those questions. Question 1: Judith Curry describes a Global Climate Model as a simulation of the Earth’s climate system, with modules that simulate the atmosphere, ocean, land surface, sea ice and glaciers. The atmospheric module simulates evolution of the winds, temperatures, humidity and atmospheric pressure using complex mathematical equations that can only be solved using computers. These equations attempt to incorporate fundamental physical principles such as Newton’s Laws of Motion and the First Law of Thermodynamics. Global Climate Models, (GCMs) also use mathematical equations to describe some complex dynamics… three dimensional ocean circulation, how it transports heat, and how the ocean exchanges heat and moisture with the atmosphere, land surface modeling to describe how vegetation, soil, snow and ice exchange energy and moisture with the atmosphere. Trying to solve these equations on a computer, GCMs divide atmosphere, oceans and land into a three-dimensional grid system. The equations are then calculated for each cell in the grid repeatedly for successive time steps marching forward in time throughout the simulation. The necessary coarseness of the model resolution is driven by the computing resources available and tradeoffs between model resolution, model complexity and length and number of simulations to be conducted. Because models’ special resolutions are relatively coarse, smaller resolutions or sub-grid resolutions, like clouds and rainfall, are represented as parameters or simple formulas which are ‘calibrated,’ or ‘tuned’ so that models perform adequately when compared with historical observations. This calibration is needed because the real processes are either poorly understood or too complex to incorporate into the models. Question 3: A significant failing of climate models is their failure to understand the causes of global warming. Models’ assumptions of human – caused warming rely not only on the amount of greenhouse gases in the atmosphere but also on how ‘sensitive’ the climate is to these increases. The equilibrium climate sensitivity (ECS) defined as the change in global mean surface temperature at equilibrium that is caused by a doubling of atmospheric CO2 concentration was estimated by the International Panel on Climate Change, (IPCC) in 2007, to be in the range 2 to 4.5 degrees. Since then the uncertainty of the range has been increasing, the bottom of the range has been lowered from 2 to 1,5 degrees, and no best estimate is now given as a consequence of substantial discrepancy between observation lower best estimations of ECS versus the higher estimates from climate models. Question 4: Regarding fitness for purpose, Judith Curry concludes that given the above and given the failure of climate models to explain the observed early 20th century warming and the mid-century cooling, the climate models are not fit for the purpose of simulating and predicting the evolution of Earth’s climate. So there it is. Given the above analysis by Professors Curry, Lindzen, McKitrick and Alexander … alas, you modelers in cloud towers, whiling away the tenured hours, looks like those climate models, beautiful as they may appear, just – don’t – match – the -observations and so, … well you know! U.N. AGENDA 21. BLUE-PRINT FOR A GLOBALIST UTOPIA. Taking a little stroll down Memory Lane and some history of the origins of the United Nations. Like a phoenix arising from the ashes, in 1945 the United Nations came into being as a replacement for a now discredited League of Nations, established after World War 1 to prevent future war. The League of Nations had never been a fully representative body, nor did it have formal powers to exert influence when disputes arose, and by 1939 it had become redundant and was unable to prevent the outbreak of World War 2. In the aftermath of that long war, there was widespread belief that some new institution had to be created, one better able to arbitrate international conflict and negotiate peace, with broader goals than prevention of war and formal powers beyond those of a mere advisory body, including, if required, the power of military back up. To maintain international peace and security and to that end to take effective and collective measures for the prevention and removal of threats to the peace, and for the suppression of acts of aggression or other breaches of the peace, and to bring about by peaceful means, and in conformity with justice and international law, adjustment or settlement of international disputes or situations which might lead to a breach of the peace. * Everyone has the right to take part in the government of the country, directly or through freely chosen representatives. * The will of the people shall be the basis of authority of government; this will shall be expressed in periodic and genuine elections which shall be by universal and equal suffrage and shall be held by secret vote or by equivalent voting procedures. It was not envisaged that the United Nations organization, a body for peace and freedom, would itself morph into a creeping behemoth of global power and dominance, but it has. A lot of water under the bridge since 1948 and that affirmation by the U.N. that the right to govern lies with the nation state and is derived from the consent of its people. From its beginnings in 1948 to the early 1990s, the U.N. was heavily engaged in peace- keeping operations from monitoring the Armistice Agreement in the Middle East between Israel and its Arab neighbours to more than seventy peace keeping operations, including involvement in Cold War inter-state disputes and civil war in Africa and the former Yugoslavia. Some of these involvements were relatively successful, others, as in Rwanda and Sbrenica, spectacularly unsuccessful, when U.N. peacekeepers failed to intervene to prevent mass genocide. Increasingly peace keeping began to include multi-dimensional missions requiring more administrators, police officers, legal experts, economists, electoral observers, and human rights monitors. More bureaucracy, more office HQs needed as activities expanded, not only related to peace-keeping but as a result of new roles in global intervention that the UN was taking upon itself from the 1970’s onwards. New and expanded agencies, this is what bureaucrats do. From that U.N. original official headquarters in Geneva to the official HQ General Assembly in New York, and the International Court at The Hague, the U.N. proceeded to set up regional offices to house its expanding specialized agencies, in Washington … U.N. International Monetary System, and its education organization, UNESCO, in Rome … the Food and Agriculture Organization, in Paris…the Science and Cultural Organization, in Vienna … Industry and Development Organization and there were other HQ’s in Nairobi and Montreal. Geneva became HQ for the International Labour Organization and also for the World Health Organization and the United Nations’ World Meteorological Organization. Say, What’s Behind the Green Door? Powerful people with power aims. Rockefeller was a significant donor to the United Nations, its New York HQ occupies land gifted by him, not too difficult for him to foist their technocrat mission on the world via the United Nations via the Brundtland Commission. And so they have. From the Brundtland Commission to the Rio Earth Summit and Agenda 21. The U.N. itself gave credit to the Brundtland Commission for its creation. So before I discuss some of its detail, take a look at the Agenda 21 voluminous 389 page master-plan by way of its content pages, a kind of global fly-over of a very detailed blue-print for the new international economic order, resources-based, resources-controlled and resources-rationed in the name of sustainable development and technocrat management. Following the Chapter 1 Preamble, Agenda 21 is set out in four sections. Section 11, Conservation and Management of Resources Development: Well this is certainly comprehensive, fourteen chapters of precept and regulation, a new world order alright, bureaucrat control over air, land, and all living things thereon, our energy use, control of seas, rivers and other waterways, management of all waste products, ‘waste’ denoted by them to include CO2, a basis of life on earth, without it no plants and no us. Section 111, Strengthening the Role of Major Groups: Getting everyone on board, but not as described by that UN first General Assembly in 1948, Everyone has the right to take part in the government of the country, directly or through freely chosen representatives. Agenda 21 is not about individual involvement in decision making, it is about your role as part of a collective, you are subsumed by your role ( in which the planned Delphi process prevails, plenary discussion but the outcomes are foreordained,) you are a member of the women’s group, an indigenous group, a worker group, or your role is defined as part of a business group, a science-technology group or farmers’ group, some ironic 1984 newspeak here ‘strengthening the role of farmers,’ as more and more regulations are being imposed on land use. Section 1V, Means of Implementation … involving financing and costs You’ll get a shock when you go there. Some hefty estimated annual costs included in Means of Implementation… Utopias don’t come cheap, quite a drain on nation’s economies. So if you’re needing to get the citizens on board for all that costly and controlling regulation you have to be persuasive, consider that H.L. Mencken adage about keeping the populace alarmed and hence clamouring for government to save them. You have to scare people and here’s how you do it … by way of SCIENCE and GUILT, Global Warming caused by us! That’s Chapter 35, ‘Science for sustainability,’ messaging by the Inter-government Panel on Climate Change set up by the UN and charged with a mission to assess human caused global warming. Any wonder they found it, though their temperature models don’t match observations and they had to disappear past warming in the historical record to achieve it. Further Means of Implementation in Agenda 21, Chapter 36, ‘Promoting education, public awareness and training.’ Have to get school children on board, the mandatory international Education Core-Curriculum teaches sustainability from Prep to Year 12, in every subject, even math. Public awareness by public broadcasters, listen to the pervasive advertising and admonitions of thou shouldst or thou shouldst not. Leaders of large news outlets, CNN and Time Magazine include Trilateral members, Google, remember that Trilateral Commission connection, Google is censoring information. So now let’s give it some teeth.L-A-W-Law, Chapter 38, ‘International legal instruments and mechanisms,’ they’re by-passing nation’s laws here, now isn’t that contra to… The will of the people shall be the basis of authority of governments; this will shall be expressed in periodic and genuine elections which shall be by universal and equal suffrage and shall be held by secret vote or by equivalent voting procedures. More on legal means of implementation later. Some doubtful calls in the above. Those claims of worsening standards of living? Not according to Hans Rosling showing data from World Census stats. https://www.youtube.com/watch?v=usdJgEwMinM That call for U.N. assistance? Can’t remember when we were asked. Decisions from afar, we the people don’t get to vote on those treaties and conventions that can have such a pervasive effect on our lives. You see the effect with that case study for technocrat management, the European Union, where fiat decision making has brought currency crises, high youth unemployment http://www.ruthfullyyours.com/2015/07/03/andrew-stuttaford-what-the-euro-has-wrought/ and social problems from unchecked immigration programs. So now let’s take a closer look at some of the content in Agenda 21. In nice bureaucratic patterning the chapters in each of the four sections are set out in terms of ‘Basis for Action,’ ‘Objectives,’ ‘Activities’ and ‘Means of Implementation.’ Each chapter has segments, Part a. parts b and c, and some even go to parts j and k and l.
One of those chapters with parts a to l is Chapter 14, ‘Promoting Sustainable Agriculture and Rural Development,’ the U.N SARD program that extends to 24 pages of prescripts and program areas for technocratic implementation. It certainly comes as quite a drain on national economies. Totaling the estimated average annual costs, years 1993 to 2000, for Chapter 14 alone, programs a to l, exceeded two trillion dollars. In the above list from section a … (hope you’re following the sections and sub-sections bureau-format … think Russian wooden dolls, inside each, another…) you’ll see lots of information gathering words, ‘identify’, ‘collect,’ ‘review,’ ‘monitor.’ Technocrats rely on big data collection to socially engineer us and dictate what, when, how resources are to be managed. Imbedded in most chapters in ‘activities,’ you’ll find mention of the importance of setting up national and international data bases. Not a win-win exchange, however, when large tracts of land can no longer be utilized by the people and are now managed by outsiders, where hefty transaction costs paid for by the debtors and people like the Barhwa pygmies of Zaire, the Batwa pygmies of Rwanda and the Sanje bush people in Kenya have been driven from their ancestral lands to make way for national conservation parks, all managed in part by WWF people. Give me land lots of land under starry skies above, tra la..
There’s also a land acquisition program taking place in developed nations as per Chapter 15 .3 of Agenda 21 proposing ‘urgent and decisive action’ to be taken ‘to conserve and maintain genes, species and ecosystems with a view to the sustainable management and use of biological resources.’ The UN-designed Wildlands Project, a master plan of Agenda 21, is part of the design to transform land from public ownership to large tracts of no-go wilderness managed by technocrats, each eco-area protected by buffer zones and with designated corridors linking human habitation areas. 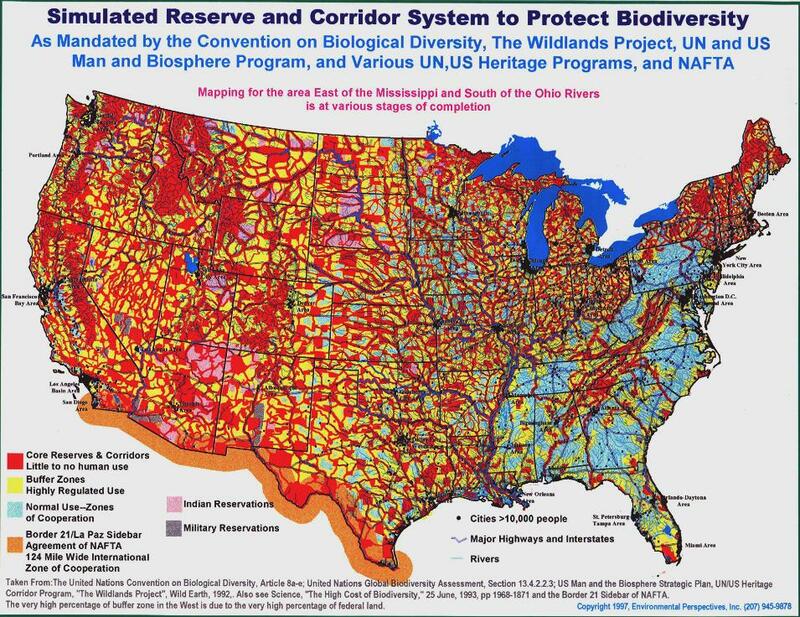 In the United States, in 1993, the Clinton Administration adopted the Agenda 21 Wildlands Project Plan and here it is, easily available on the internet. An allied program to the UN Habitat Sustainable Cities Programme is ICLEI the International Council for Local Environmental Initiatives. Section 7.21. Agenda 21, specifically recommends involvement with ICLEI, not surprising since ICLEI was responsible for preparing the Local Council section of Agenda 21. A lot of local councils have already adopted Agenda 21 initiatives under names like ‘A Greener City.’ What these programs envisage is a way of life in cities across four domains of ecology, economics, politics and culture, the sustainable city that will feed itself with a sustainable reliance on surrounding countryside, power itself with renewable energy and produce the smallest conceivable ecological footprint and climate change impact. In my home town in OZ, the Melbourne City Council is already on board with new building codes for sustainable development. More high-rise development along public transport systems, punitive rates charges on single dwellings, bike zones on main roads and controls on energy use, twin planks of technocrat control, land use and energy , item 7.3, in their Greening City Policy. Bears repeating, United Nations 1948: Everyone has the right to take part in the government of the country, directly or through freely chosen representatives. The first is by way of ambiguously phrased UN International Treaties that play an increasingly large and influential role in determining judicial outcomes compared to less ambiguous, domestic regulations, international treaties which have been formulated without any citizen input. The second type of international law, known as customary law, is a non-treaty sort of international law that can flow on from treaties and have influence on local judicial decision making although it has never been agreed to by any accountable legislators. Who gets to make these decisions are publicists, legal academics who have no democratic warrant whatsoever, and as James Allan points out, as a group ‘may well have political and moral views that diverge from those of the general public.’ And James Allan notes, regarding the election of this group of people into the International Court of Justice, many of them from non-democracies, a great deal of horse trading takes place, a method of selecting International Court judges that Allan describes as ‘opaque,’ The article is a detailed description of ways, via International Law, that a nation’s voters are overwhelmingly locked out when it comes to resolving debatable social policies. Well that’s it cits, Agenda 21 globalist Utopia? What do we do, it’s over to you and me and us. Gotta’ get political parties representing us at the national level. Say, doesn’t everyone have the right to take part in the government of the country, directly or through freely chosen representatives ? THE SINGER AND THE SONG. Part 2. Male Singers and their Songs. For Jack A., Another songster. If you’ve skipped Part 1 of ‘The Singer and the Song,’ about women singers and popular music from the 1940’s to the 1990’s, I’m arguing, contra to studies of modern music claiming a dumbing-down post the 1950’s, that there’s a lot of musical creativity out there, right up to the 1990’s, when the music industry was taken over by a few dominant commercial companies. These stranglehold production companies are ‘manufacturing’ music aimed at mass audiences via controlled outlets, resulting in a decline in popular music as noted, decrease in harmony, timbre and metric complexity, increased volume and dumbing-down of song lyrics. But listen to many male singers and their songs, 1940’s-1980’s, there’s a rich fusion of sense and sound to be found across genres, a gamut of emotions from affirmation to angst, from complaint to contemplation. But here’s the thing, unlike the instinctive signaling of that Darkling Thrush, likely to be directly received just as instinctively by another thrush, these songs about feeling, to which we respond, are ‘about’ emotion, not emotion expressed per se. We may be ‘wired’ for music, that throbbing drumbeat, but it’s more complex than bird song signaling and response. No natural equivalence exists inherently between musical sounds and feelings, but rather, we’re disposed to metaphor, to seeking equivalences of musical experiences to feelings and values … the ‘positive’ major key, the ‘negative’ minor key, … the fast, ‘lilting’ beat, the slow, ‘sad’ beat. Music explores metaphor. And there’s a context thing of culture and genre –we’re a-tune to it. Leonard Cohen, poet before he became a singer/song-writer, does the range, affirmation to angst. In his song, ‘Dance Me to the End of Love,’ released in 1984, there’s affirmation with undertones. It’s a Wedding Celebration song, … ‘Dance me to the wedding now, dance me on and on,’ … ‘Dance me to the children who are waiting to be born,’ … affirmation suggestd by the steady 4/4 beat and musical harmony, the chorus alto background and lyrical pathway music by a singing violin. But kinda’ bitter-sweet, those alto deep undertones, the violin singing in minor key. It is a love song but Cohen recounts part of its mysterious origins, his image of ‘burning violins’ being influenced by the World War 11 Holocaust where Jewish prisoners were pressed into playing classical music while other prisoners were being killed. From affirmation to angst, or, rather, in the next three songs, more feelings of regret for something past, than the unfocused malaise of angst. Paul McCartney, singer-songwriter and his song, ‘Yesterday,’one of my favourite songs evah. I like this version, 1965, because it’s where it began, and we hear Paul McCartney as a young minstrel. Look at the intricate patterning, sort of like 15th century poet, Thomas Wyatt’s poems about lost love, listen to its rhythmical rhyming, ‘Yesterday,’ ‘here to stay,’ ‘suddenly,’ ‘used to be,’ ‘shadow hanging over me,’ ‘she wouldn’t say,’ and continuing to the last stanza, ‘Yesterday, love was such an easy game to play,/ Now I need a place to hide away,/ Oh I believe in yesterday/’ There’s a subtle change of pattern in the third stanza, two lyric lines, then a descending scale of four minor chords, implying reflection without words. Yves Montand, French chanteur, and classic song, ‘Autumn Leaves,’ ‘Les Feuilles Mortes,’ famous in French and in English, composed in 1945 by Hungarian-French song writer, Joseph Kosma, lyrics by Jacques Prevert, English lyrics by American song writer, Johnny Mercer. It’s another famous song about regret, written in minor key, a song of harmonic balance, of ascending then descending motifs, a composition of lovely restraint. It seems fitting Yves Montand singing it at the end of a long career. Gordon Lightfoot singer, song writer and this, another favourite…mmm, his song written in 1970, ‘If You Could Read My Mind, Love.’ There’s a seeming simplicity, but it’s an artful simplicity, doesn’t even need the accompanying orchestral backing, lovely as it is, there’s that harmonic counter-point of voice and guitar, subtle vibration of the singer’s voice, the ‘sad’ oscillating rhythm, descending chords of ‘I don’t know where we went wrong / but the feeling’s gone/and I just can’t get it back.’ And there’s the poetry of the lyrics, not metaphor but simile, ‘Just like an old time movie/’bout a ghost in a wishing well,’…‘the hero will be me…’ I particularly like this kayak video with the song, the vulnerable craft ending up in the reeds. How goes the world about? … A subject of Complaint. Angst lifts up a register to complaint. No one does it better than Bob Dylan. Bob Dylan singing ‘Mr Tambourine Man,’ at Newport Festival in 1964, voice more penetrating than musical, but his vocal’ I am here,’ no less vigorous than the song of Hardy’s darkling thrush. And Dylan is more explorative in song and messaging than any song bird, his creative music history spans half a century, singer-songwriter, performer on guitar, keyboard and harmonica, his music crosses genres. In his recording career, Dylan has explored many of the traditions in American song—from reinvigorating folk music, to blues, gospel and rock and roll. Backed by a changing lineup of musicians, he has toured steadily since the late 1980s on what has been dubbed “the Never Ending Tour.’ In 2017 Dylan released an album, ‘Triplical,’ comprising 30 new recordings of classic songs such as ‘As Time Goes By.’ And still going, few musicians as prolific as Bob Dylan. Bet yr thought I’d left out Elvis? No way! Elvis Presley, one of the legendary rock’n roll performers of the 1950’s-60’s. burst on to the rock scene like a bombshell in January, 1956, with the song, ‘Heartbreak Hotel… ‘Although it’s always crowded, (dah-dah) / You still can find some room, (dah-dah) / For broken hearted lovers / To cry there in the gloom, /’ ‘Heartbreak Hotel,’ written by high school teacher, Mae Boren Axton, sung and performed by Elvis, was top of the hit parade in the US for seven consecutive weeks.’ In 2004, it was named as one of the 500 greatest songs evah. … So was it the gyrating performance by Elvis as he played his rhythmic guitar accompaniment that made him so famous? Partly, but also the voice, range of three octaves, rich timbre of low notes, – Elvis was a singer! In Part 1 of ‘Singer and Song’ I present research claims that over decades there’s been increasing volume and repetition in popular music. You’ll certainly find volume and repetition here, but don’t be fooled, listen to the long melody, harmony of the symphonic guitar orchestration, the intricate metre, insistent drum beat and rich vocal harmonics in the tradition of gospel singing. And Freddie’s singing! He has the range and musicality that allows just a few great artists the freedom to play dangerously with motifs and surprise and delight us. Before I show the stage performance, listen to this, voices and lyrics in a complex interplay. Herewith, the performance, more peacock or lyre-bird display than darkling thrush song. : -) Freddie Mercury on keyboard. That communication, Ground Control to Major Tom, and then … such varied emotional charges evoked by the three scenarios. Gravitas of the first scenario, slow drum beat and then drum rattle as in a military parade, deep voice of the singer. Second scenario, triumphant highlight, mission achieved! David Bowie’s voice has been recorded so that he sings a back-up harmony with himself, a guitar riff, chords ascending, of affirmation. Then a lovely lyrical verse, listen to the poetic assonance of the second line, ‘For here / I am sitting in a tin can, / Far away, / Planet Earth is blue, /And there’s nothing I can do.’ Scenario three, insistent, urgent question, ‘Can you hear me Major Tom? / Can you …’ Ends with those shimmering space effects. David Bowie’s Space ‘Odditity,’ subtle creation, … took some concentration. Listen to it twice. Meanwhile Earthlinks … a finale of affirmation is called for, despite all. What better than The Traveling Wilburys, ‘End of the Line,’ from their second album. The ‘Traveling Wilburys were a British-American super-group consisting of George Harrison, Bob Dylan, Jeff Lynne, Tom Petty and Roy Orbison. The band recorded two albums, the first in 1988 and the second in 1990, though Orbison died before the second was recorded. In the video you’ll see a rocking chair for missing member, Roy Orbison. You might also like to listen to that first album with the five singers all present. It blew too hard – the aim was song. And listen how it ought to go! The aim was song – the wind could see. ‘Singers and songs,’ here being mainly songs of yesteryear, state of pop music being what it is today…There’s a survey doing the rounds says that pop music is louder, dumber, less harmonious than in days of yore. Hmmm, look, I don’t need a survey to tell me about pop music today, hear enough of it in shopping plazas and emporiums, on TV, ‘The Voice,’ you hear it on the radio every time you switch on a dial. I could play some of it for you from the internet, but life’s too short to suffer that mechanical beat, the banal repetitious chorus, that signature two-note whoop, ‘ Eey-oh – ee-ey-oh’ that’s taken up everywhere by frenzied, arm-waving, adolescent audiences. Researchers at the Spanish National Research Council ran recordings from all genres of popular music from the period 1955-2010, (the ‘Million Song Dataset,’) through a series of algorithms to analyze harmonic complexity, timbral diversity and loudness. Their study, ‘Measuring the Evolution of Contemporary Western Popular Music,’ http://www.nature.com/articles/srep00521 found that since the 50’s there has been a decrease in harmonic complexity, not only in the diversity of chords in songs but also in the musical pathways between chords, less inventiveness in linking their harmonies together, less creative and more commercial production, The study also found that timbres or distinct textures produced by different instruments playing the same notes have become more homogenous over time, and when it comes to volume, surprise, surprise, music is becoming, on average, steadily louder. Doing the rounds there are also a few word-count studies of song lyrics in pop music, drawing a similar conclusion regarding complexity, a conclusion that ‘less equates with worse.’ One study by William Briggs measures repetition and ratio of unique words to total words of the most popular song in each year from 1950 to 2010, with the idea that, on average, a song that is more repetitive is worse than a song with more expansive lyrics. http://wmbriggs.com/post/4405/ He finds that, post 1980, there’s been quite a considerable drop in word uniqueness per song, with 2019 and 2010 favorites, ‘Boom Boom Pow’ and ‘Tik Tok’ lyrics matching the titles’ sophistication. Hey, while limited vocabulary may not necessarily equate with awfulness, in these two songs it does. Now it follows that one swallow does not a summer make, nor does one top-of-the-pops song reveal all beneath the event horizon. And in judging artistic value, a statistical approach is unlikely to tell you much. However the above studies do suggest a problem of declining choice in the devices and means of artistic creation, limits of means to an end for the artist, limits of engagement for the audience. And highly significant are those references to market control by just a few dominant companies in the music industry in the last three decades, companies that commercially manufacture songs to promote the familiar and push their products to make them popular, by way of controlled outlets, to the least discerning of audiences. The fusion of sense and sound. As Russ MacDonald argues, ‘The burgeoning of tragedy owed much to the invention of a poetic language suitable for it, unrhymed iambic pentameter, or blank verse.’ Writers prior to its development were hampered by prosodic forms like the fourteen syllable line that tended to split in two, producing a clumsy monotony, and a defined line ending necessitated by the demands of rhyming verse. As those who move easiest who have learned to dance. As in poetry, likewise in music, thanks to what Ernst Gombrich describes as ‘the infinite elasticity of the human mind,’ our use of metaphor, of finding ‘equivalences in disparate phenomena and of substituting one for another,’ ( ‘Meditations on a Hobby Horse,’ P 14.) Because of our predilection for metaphor, we are able to respond to a musical experience as the equivalent of a moral value or a transference from one sensory experience to another, -‘a noble chorus,’ ‘ a velvet tone,’ ‘cheerful polka’ or even ‘a grim scherzo.’ And thanks to the evolution of music’s means, musical structures, chords, major and minor keys, all the symphonic and instrumental developments of classical music, even a song without words can suggest to us aspects of the human condition, from deep, elemental, human emotions to ordered, harmonious, ‘civilized’ experience. And sometimes, says Kenneth Clark, speaking of opera, that which is ‘too silly to be said may be sung.’(‘Civilization.’ Ch 9. The Pursuit of Happiness.) The fusion between sense and sound in music can be complicated, even ironic. So let’s listen to some popular songs and their singers. I’m starting with the 1930s, one of the great periods of song writers like Irving Berlin, Jerome Kern, Cole Porter and George and Ira Gershwin, their classic songs still sung in the decades beyond the 30’s, you’ll hear them today. Who can forget Ginger and Fred dancing ‘cheek to cheek,’ one of Irving Berlin’s best songs. That dance scene! https://beththeserf.wordpress.com/2016/02/29/37th-edition-serf-under_ground-journal/ Here Irving Berlin’s song sung by Ella Fitzgerald. Metrical stress falls on the words, ‘you’, ‘the one,’ ‘night and day,’ and its inverse, ‘day and night’ to convey the lover’s state of mind. And Frances Faye gets it and literally ‘plays’ with it, accompanying herself on the piano as she sings Cole Porter’s song with witty improvisations that emphasize the song’s complexity. In the early forties, young movie star, Judy Garland, singing one of Jerome Kern’s loveliest songs. Judy Garland does ‘some day’ so well and repeats it in another song, ‘Over the Rainbow,’ composed by Harold Arien. Here she is in 1939 in ‘The Wizard of Oz,’ – with Toto. It’s the 1940’s, can’t have famous songs and singers without Piaf, French chanteuse, and that song, ‘La Vie on Rose.’ ‘Quand il me prend dans ses bras / il me parle tout bas / je vois la vie en rose.’ A song of affirmation in sound and in sense, and Piaf’s distinctive voice! Generally the song is sung as musicale introduction to the forthcoming teen-age romance, emphasis sentimental. Here in minor key and a fraction off key, a complaining duet by soloist and saxophone, a witty exploitation of the negatives that the lyrics list: ‘It isn’t even Spring,’ ‘I haven’t seen a crocus or a rose bud,’ and of the negative feelings expressed, ‘restless,’ ‘ jumpy,’ ‘vaguely discontented.’ It’s a subversive rearrangement of the original song to focus on the uncertainties and painful emotions of adolescent romance. Notice in those closing bars, the dissonance by singer and saxophone. Pop music, expect street smart songs about love and battle of the sexes, tough lyrics. What you get with two singer-songwriters, Blondie, Debbie Harrie, ‘Heart off Glass’ and Madonna, ‘Borderline,’ are songs of intricate metre and lovely melody. Madonna is known for pushing the boundaries with lyrics, ‘Like a Virgin,’ but here in ‘Borderline,’ listen to the harmonic arrangement. The film-clip portrays bravado street-culture and brat behavior, but hear Madonna’s refined singing tone, it’s a love song, and look at her expressive acting! The Miracle of Vision …The Making of the Eye. The Making of the Eye. “Can then physics and chemistry out of themselves explain that a pin’s-head ball of cells in the course of so many weeks becomes a child? They more than hint that they can. A highly competent observer, after watching a motion-film photo-record taken with the microscope of a cell-mass in the process of making bone, writes: ‘Team-work by the cell-masses. Chalky spicules of bone-in-the-making shot across the screen, as if labourers were raising scaffold-poles. The scene suggested purposive behaviour by individual cells, and still more by colonies of cells arranged as tissues and organs.’ That impression of concerted endeavour comes, it is no exaggeration to say, with the force of a self-evident truth. The story of the making of the eye carries a like inference. The eye’s parts are familiar even apart from technical knowledge and have evident fitness for their special uses. The likeness to an optical camera is plain beyond seeking. If a craftsman sought to construct an optical camera, let us say for photography, he would turn for his materials to wood and metal and glass. He would not expect to have to provide the actual motor power adjusting the focal length or the size of the aperture admitting light. He would leave the motor power out. If told to relinquish wood and metal and glass and to use instead some albumen, salt and water, he certainly would not proceed even to begin. Yet this is what that little pin’s-head bud of multiplying cells, the starting embryo, proceeds to do. And in a number of weeks it will have all ready. I call it a bud, but it is a system separate from that of its parent, although feeding itself on juices from its mother. And the eye it is going to make will be made out of those juices. Its whole self is at its setting out not one ten-thousandth part the size of the eye-ball it sets about to produce. Indeed it will make two eyeballs built and finished to one standard so that the mind can read their two pictures together as one. The magic in those juices goes by the chemical names, protein, sugar, fat, salts, water. Of them 80 per cent is water. Water is the great menstruum of ‘life’. It makes life possible. It was part of the plot by which our planet engendered life. Every egg-cell is mostly water, and water is its first habitat. Water it turns to endless purposes; mechanical support and bed for its membranous sheets as they form and shape and fold. The early embryo is largely membranes. Here a particular piece grows fast because its cells do so. There it bulges or dips, to do this or that or simply to find room for itself. At some other centre of special activity the sheet will thicken. Again at some other place it will thin and form a hole. That is how the mouth, which at first leads nowhere, presently opens into the stomach. In the doing of all this, water is a main means. The eye-ball is a little camera. Its smallness is part of its perfection. A spheroid camera. There are not many anatomical organs where exact shape counts for so much as with the eye. Light which will enter the eye will traverse a lens placed in the right position there. Will traverse; all this making of the eye which will see in the light is carried out in the dark. It is a preparing in darkness for use in light. The lens required is biconvex and to be shaped truly enough to focus its pencil of light at the particular distance of the sheet of photosensitive cells at the back, the retina. The biconvex lens is made of cells, like those of the skin but modified to be glass-clear. It is delicately slung with accurate centering across the path of the light which will in due time some months later enter the eye. In front of it a circular screen controls, like the iris-stop of a camera or microscope, the width of the beam and is adjustable, so that in a poor light more is taken for the image. In microscope, or photographic amera, this adjustment is made by the observer working the instrument. In the eye this adjustment is automatic, worked by the image itself! The lens and screen cut the chamber of the eye into a front half and a back half, both filled with clear humour, practically water, kept under a certain pressure maintaining the eye-ball’s right shape. The front chamber is completed by a layer of skin specialised to be glass clear and free from blood-vessels which if present would with their blood throw shadows within the eye. This living glass-clear sheet is covered with a layer of tear-water constantly renewed. This tear-water has the special chemical power of killing germs which might inflame the eye. This glass-clear bit of skin has only one of the fourfold set of the skin-senses; its touch is always ‘pain’, for it should not be touched. The skin above and below this window grows into movable flaps, dry outside like ordinary skin, but moist inside so as to wipe the window clean every minute or so from any specks of dust, by painting over it fresh tear-water. The light-sensitive screen at the back is the key-structure. It registers a continually changing picture. It receives, takes and records a moving picture life-long without change of ‘plate’, through every waking day. It signals its shifting exposures to the brain. This camera also focuses itself automatically, according to the distance of the picture interesting it. It makes its lens ‘stronger’ or ‘weaker’ as required. This camera also turns itself in the direction of the view required. It is moreover contrived as though with forethought of self-preservation. Should danger threaten, in a moment its skin shutters close protecting its transparent window. And the whole structure, with its prescience and all its efficiency, is produced by and out of specks of granular slime arranging themselves as of their own accord in sheets and layers and acting seemingly on an agreed plan. That done, and their organ complete, they abide by what they have accomplished. They lapse into relative quietude and change no more. It all sounds an unskilful overstated tale which challenges belief. But to faithful observation so it is. There is more yet. The little hollow bladder of the embryo-brain, narrowing itself at two points so as to be triple, thrusts from its foremost chamber to either side a hollow bud. This bud pushes toward the overlying skin. That skin, as though it knew and sympathized, then dips down forming a cuplike hollow to meet the hollow brain-stalk growing outward. They meet. The round end of the hollow brain-bud dimples inward and becomes a cup. Concurrently, the in-growth from the skin nips itself free from its original skin. It rounds itself into a hollow ball, lying in the mouth of the brain-cup. Of this stalked cup, the optic cup, the stalk becomes in a few weeks a cable of a million nerve-fibres connecting the nerve-cells within the eye-ball itself with the brain. The optic cup, at first just a two-deep layer of somewhat simple-looking cells, multiplies its layers at the bottom of the cup where, when light enters the eye – which will not be for some weeks yet – the photo-image will in due course lie. There the layer becomes a fourfold layer of great complexity. It is strictly speaking a piece of the brain lying within the eye-ball. Indeed the whole brain itself, traced back to its embryonic beginning, is found to be all of a piece with the primordial skin – a primordial gesture as if to inculcate Aristotle’s maxim about sense and mind. The deepest cells at the bottom of the cup become a photo-sensitive layer – the sensitive film of the camera. If light is to act on the retina – and it is from the retina that light’s visual effect is known to start – it must be absorbed there. In the retina a delicate purplish pigment absorbs incident light and is bleached by it, giving a light-picture. The photo-chemical effect generates nerve-currents running to the brain. The nerve-lines connecting the photo-sensitive layer with the brain are not simple. They are in series of relays. It is the primitive cells of the optic cup, they and their progeny, which become in a few weeks these relays resembling a little brain, and each and all so shaped and connected as to transmit duly to the right points of the brain itself each light-picture momentarily formed and ‘taken’. On the sense-cell layer the ‘image’ has, picture-like, two dimensions. These space-relations ‘reappear’ in the mind; hence we may think their data in the picture are in some way preserved in the electrical patterning of the resultant disturbance in the brain. But reminding us that the step from electrical disturbance in the brain to the mental experience is the mystery it is, the mind adds the third dimension when interpreting the two dimensional picture! Also it adds colour; in short it makes a three dimensional visual scene out of an electrical disturbance. All this the cells lining the primitive optic cup have, so to say, to bear in mind, when laying these lines down. They lay them down by becoming them themselves. The human eye has about 137 million separate ‘seeing’ elements spread out in the sheet of the retina. The number of nerve-lines leading from them to the brain gradually condenses down to little over a million. Each of these has in the brain, we must think, to find its right nerve-exchanges. Those nerve-exchanges lie far apart, and are but stations on the way to further stations. The whole crust of the brain is one thick tangled jungle of exchanges and of branching lines going thither and coming thence. As the eye’s cup develops into the nervous retina all this intricate orientation to locality is provided for by corresponding growth in the brain. To compass what is needed adjacent cells, although sister and sister, have to shape themselves quite differently the one from the other. Most become patterned filaments, set lengthwise in the general direction of the current of travel. But some thrust out arms laterally as if to embrace together whole cables of the conducting system. Nervous ‘conduction’ is transmission of nervous signals, in this case to the brain. There is also another nervous process, which physiology was slower to discover. Activity at this or that point in the conducting system, where relays are introduced, can be decreased even to suppression. This lessening is called inhibition; it occurs in the retina as elsewhere. All this is arranged for by the developing eye-cup when preparing and carrying out its million-fold connections with the brain for the making of a seeing eye. Obviously there are almost illimitable opportunities for a false step. Such a false step need not count at the time because all that we have been considering is done months or weeks before the eye can be used. Time after time so perfectly is all performed that the infant eye is a good and fitting eye, and the mind soon is instructing itself and gathering knowledge through it. And the child’s eye is not only an eye true to the human type, but an eye with personal likeness to its individual parent’. The many cells which made it have executed correctly a multitudinous dance engaging millions of performers in hundreds of sequences of particular different steps, differing for each performer according to his part. To picture the complexity and the precision beggars any imagery I have. But it may help us to think further. There is too that other layer of those embryonic cells at the back of the eye. They act as the dead black lining of the camera; they with their black pigment kill any stray light which would blur the optical image. They can shift their pigment. In full daylight they screen, and at night they unscreen, as wanted, the special seeing elements which serve for seeing in dim light. These are the cells which manufacture the purple pigment, ‘visual purple’, which sensitizes the eye for seeing in low light. Then there is that little ball of cells which migrated from the skin and thrust itself into the mouth of the eye-stalk from the brain. It makes a lens there; it changes into glass-clear fibres, grouped with geometrical truth, locking together by toothed edges. The pencil of light let through must come to a point at the right distance for the length of the eye-ball which is to be. Not only must the lens be glass-clear but its shape must be optically right, and its substance must have the right optical refractive index. That index is higher than that of anything else which transmits light in the body. Its two curved surfaces back and front must be truly centred on one and the right axis, and each of the sub-spherical curvatures must be curved to the right degree, so that, the refractive index being right, light is brought to a focus on the retina and gives there a shaped image. The optician obtains glass of the desired refractive index and skilfully grinds its curvatures in accordance with the mathematical formulae required. With the lens of the eye, a batch of granular skin-cells are told off to travel from the skin to which they strictly belong, to settle down in the mouth of the optic cup, to arrange themselves in a compact and suitable ball, to turn into transparent fibres, to assume the right refractive index, and to make themselves into a subsphere with two correct curvatures truly centred on a certain axis. Thus it is they make a lens of the right size, set in the right place, that is, at the right distance behind the transparent window of the eye in front and the sensitive seeing screen of the retina behind. In short they behave as if fairly possessed. I would not give a wrong impression. The optical apparatus of the eye is not all turned out with a precision equal to that of a first-rate optical workshop. It has defects which disarm the envy of the optician. It is rather as though the planet, producing all this as it does, worked under limitations. Regarded as a planet which ‘would’, we yet find it no less a planet whose products lie open to criticism. On the other hand, in this very matter of the eye the process of its construction seems to seize opportunities offered by the peculiarity in some ways adverse of the material it is condemned to use. It extracts from the untoward situation practical advantages for its instrument which human craftsmanship could never in that way provide. Thus the cells composing the core of this living lens are denser than those at the edge. This corrects a focusing defect inherent in ordinary glass-lenses. Again, the lens of the eye, compassing what no glass-lens can, changes its curvature to focus near objects as well as distant when wanted for instance, when we read. An elastic capsule is spun over it and is arranged to be eased by a special muscle. Further, the pupil – the camera stop – is self-adjusting. All this without our having even to wish it; without even our knowing anything about it, beyond that we are seeing satisfactorily. The making of this eye out of self-actuated specks which draw together and multiply and move as if obsessed with one desire namely to make the eye-ball. In a few weeks they have done so. Then, their madness over, they sit down and rest, satisfied to be life-long what they have made themselves, and, so to say, wait for death. The chief wonder of all we have not touched on yet. Wonder of wonders, though familiar even to boredom. So much with us that we forget it all the time. The eye sends, as we saw, in to the cell-and-fibre forest of the brain throughout the waking day continual rhythmic streams of tiny, individually evanescent, electrical potentials. This throbbing streaming crowd of electrified shifting points in the spongework of the brain bears no obvious semblance in space-pattern, and even in temporal relation resembles but a little remotely the tiny two dimensional upside-down picture of the outside world which the eyeball paints on the beginnings of its nerve-fibres to the brain. But that little picture sets up an electrical storm. And that electrical storm so set up is one which affects a whole population of brain-cells, Electrical charges having in themselves not the faintest elements of the visual – having, for instance, nothing of ‘distance’, ‘right-side-upness”, nor ‘vertical’, nor ‘horizontal’, nor ‘colour’, nor ‘brightness’, nor ‘shadow’, nor ‘roundness’, nor ‘squareness”, nor contour’, nor ‘transparency’, nor ‘opacity’, nor ‘near’, nor ‘far’, nor visual anything – conjure up all these. A shower of little electrical leaks conjures up for me, when I look, the landscape; the castle on the height, or, when I look at him, my friend’s face, and how distant he is from me they tell me. Taking their word for it, I go forward and my other senses confirm that he is there. It is a case of ‘the world is too much with us’; too banal to wonder at. Those other things we paused over, the building and shaping of the eye-ball, and the establishing of its nerve connections with the right points of the brain, all those other things and the rest pertaining to them we called in chemistry and physics and final causes to explain to us. And they did so, with promise of more help to come. Seeking Answers to Life’s Hard Questions. Intuitively we, that is, serfs like me, think we comprehend the simplest form of adaptive evolution, a direct process of an A1-A2-A3-A4 series of step change along a single axis, each step serving the same function as the one before, but doing it more effectively. More difficult for us to comprehend, regarding organs like the human eye, the complex transition from mere light-sensor animals, some in which the optic nerve is deeply buried in the body and serves some circadian function, to the simplest organ which can be called an eye, but without any lens or refractive body, and on to the image forming and image adjusting apparatus of the complex eye. Darwin also refers to the swim-bladder in fishes as an example of an organ with two functions, namely buoyancy and respiration, evolving into an exclusively respiratory function and eventually into tetrapod lungs. In accounting for a chain of descent that evolves without breaks, the Springer article expands on Darwin’s transitional gradations. The article describes the various processes that taken together are considered to meet this requirement. Given that exaptations are defined largely by what they are not, namely the products of natural selection strictly for their current function, there are several routes by which an organ (or gene) can become an exaptation. One way is where an organ (or gene) takes on a new function as a result of selective pressures after the organism experiences environmental change. Another exaptation is where modification of a feature for the initial function makes it more amenable to modification in a new role and this allows the organism to move into a new environment or life style. A third exaptation can come about where an organ (or gene) has two functions and is modified as it becomes increasingly specialized for one of them, as Darwin noted with the fish swim -bladder to tetetrapod lungs. Two Legs Good, Four Legs Maybe Better? Lots more in the article. I’ll just conclude with three of the misconceptions it discusses. Misconceptions about Complex Organ Evolution. # Supposed intermediate stages in the evolution of complex organs could not be functional. To reiterate… what good is half an X where X is any feature such as a wing or an eye? Even with missing parts a wing can be used for something else, gliding, fighting, feathers for warmth. Even misaligned eyes have some vision, eyes missing rod and cone cells may still serve a circadian function. With less complex stages, the only requirement is that the less complex stage be good for something. # An inability to explain every detail of a complex organ’s history challenges the validity of evolutionary science. Thanks to work carried out in pursuit of natural explanations, a great deal is now understood about the form, function and probable origins of complex biological organs and systems, and there is a convergence of several independent lines of enquiry, data from genetics, molecular biology, comparative anatomy and paleontology, that point to the same conclusion that eyes are a product of natural evolution mechanisms. # Biologists propose that complex organs arise ‘by chance. The variation upon which natural selection acts is generated by mutation, and it is certainly the case that these accidents of inheritance occur randomly with respect to any consequences that they may have. It is also true that natural selection possesses no capacity for foresight and has no final objectives as it alters population characteristics from one generation to the next. It does not follow, however, that the evolution of complex organs occurs ‘by chance.’ By definition, natural selection is the non-random differential success of individuals on the basis of heritable variation and therefore the cumulative outcome of this process –adaption – is the opposite of random chance. HERETICAL THOUGHTS ON LIFE’S GRANDEUR. Before science there was the Bible in which The Book of Genesis describes the mysteries of creation. In the beginning, on the first day, ‘God created the heavens and the earth.’ On the following five days God created the vaulted sky and two great lights to give day and night and He created the plants, bearing seeds ‘according to their kind,’ the creatures that swim, fly and move along the ground ‘according to their kind,’ and then God created man and woman in his image to rule over them. This was the received truth. Earth was created as the centre of the universe. Each living species came into being separate and invioliate, and according to biblical scholars, this all took place not quite 6,000 years ago. As science developed in medieval Europe, via rediscovery of early Greek philosophers and Byzantine and Islamic scholars who sought non-supernatural explanations for natural phenomena, many areas not directly challenging to the Bible’s teachings began to be explored. Reverence for biblical teachings, however, impeded any bold, systematic investigation into areas that involved church doctrine. Those few open-minded scientists who did question received truth were quickly censured by the church. In a scientific revolution that began when Nicolaus Copernicus launched his heliocentric theory on the world, there were only five men, Copernicus, Galileo, then two centuries later, James Hutton, publishing his theory of earth’s antiquity, and Charles Darwin, co-publishing with Alfred Wallace, a theory of evolution of species, who had the intellectual courage to publish heretical theories that shattered the biblically rooted picture of the creation and separated science from theology. In the second half of the seventeenth century and early eighteenth century, three expeditions by sea, two of them long voyages into the South Pacific, the other a brief excursion by rowboat off the east coast of Scotland, were to have heretical consequences as challenging to the creation story, as Copernicus and Galileo’s earlier challenge. The first of these was Lieutenant James Cook’s voyage to the South Seas in 1767 to observe the transit of Venus across the face of the sun. The Royal Society played a significant role in promoting the expedition, its largest maritime venture to date. Since its foundation in 1660, The Royal Society had placed a high value upon the empirical observations to be gained from ships’ logs and the journals of travelers on long voyages. To ensure that these potentially valuable records to science should be accurate and comprehensive, the Society included ‘Directions for Seamen, bound for far voyages’ in the first volume of its ‘Philosophical Treatise’. It was widely considered by naturalists of the period, that scientists like Sir Joseph Banks, who accompanied Cook on the 1768 voyage in the good ship Endeavour, would help complete the Genesis picture of the universe as a vast, ordered chain of being described above by Carl Linnaeus, the most influential naturalist of the eighteenth century… Well that’s what they thought, but despite the baggage in the hold, Cook’s first Pacific voyage, with three trained observers on board, naturalist Sir Joseph Banks, botanist Dr Daniel Solander and draughtsman Sydney Parkinson, some of that baggage got lost at sea. Later scientific expeditions into the South Pacific adopted the empirical practices of this first voyage, employing skilled botanists, zoologists and artists, for example, botanist Robert Brown and draughtsman Ferdinand Bauer accompanying Matthew Flinders on expedition mapping the Australian coast-line, and Frenchmen, zoologist Francois Peron and artist, Charles Lesuer, who all experienced difficulties like those of Solander. Confronted with problems presented by the multiformities of nature in the South Pacific, naturalists were finding it difficult to classify their materials according to presuppositions of a great chain of being. Ferdinand Bauer’s plant drawings and Charles Lesuer’s animal drawings show how scientific scrutiny was leading towards depiction of structure, and ‘hence to graphic penetration beyond the surface of things.’(Bernard Smith, p190,) Bauer examined scientific structure using a magnifying glass and drawing not only leaf and flower, but sections of buds, pods and plant roots. Lesueur’s drawings of fish and phosphorescent animals included anatomical sections. In Darwin’s cabin when he embarked on his famous voyage on the Beagle in 1831, was a library of 400 books which he read on the long journey. 36% on travel/ voyages and 33% on natural history and including detailed wood cut prints and engravings of plants and animals of the South Pacific. In this library were Captain Cook’s accounts of three South Pacific voyages, Matthew Flinders ‘Voyage to Terra Australis,’ and the ‘Voyage de Decouvertes aux Terres Australies’ of Francois Peron and Charles Lesueur. While Captain Cook was on his first Pacific voyage opening the way to heretical questioning of the creation story, someone else was similarly engaged in Scotland in the city of heretics, Edinburgh. Returning to Edinburgh, his place of birth, in 1767 to advise on the building of the Forth-Clyde Canal, James Hutton was soon doing more than that with his discoveries regarding the earth’s antiquity and the processes of its formation. No dearth of heretical thoughts or theories in eighteenth century Edinburgh in that mid-century flowering of critical enquiry known as The Scottish Enlightenment. Surprising, considering that just four decades prior, an eighteen year old theology student, Thomas Aikenhead, who made a flippant joke about Hell, was sentenced to death for blasphemy, a sentence carried out in January 1697. Who could have seen, for this impoverished but literate society, that the next century would mark the end of their culturally and materially constrained way of life and the beginning of a new age which would generate basic institutions, habits of mind and ideas that had effects impacting far beyond their native land. A short list of those heretical actors of the Scottish Enlightenment includes William Robertson, one of the founders of modern historical research, David Hume, whose Treatise on Human Nature influenced views of human rationality up until today, including having an impact on the founding fathers of the United States. Then there’s Adam Smith, beginning the study of economics with his Wealth of Nations, and chemist Joseph Black, who discovered that earth’s atmosphere is made up of a mixture of gases including carbon dioxide, and employed for a time in Joseph Black’s laboratory, there’s James Watt who invented the practical steam engine. Perhaps the most heretical of them all was Joseph Black’s friend, James Hutton, the father of modern geology. When Hutton returned to Edinburgh, he was already one of Scotland’s leading mineralogists and had begun forming his theory of the earth’s formation as a recycling process of erosion. In Edinburg, Hutton was introduced to Joseph Black, who became his close friend and supporter. While exploring the phenomenon of latent heat, Joseph Black had come to understand the role that pressure played on heated substances, an insight important to Hutton’s thinking. With this insight, Hutton would take his early experiences from farming and field trips and turn them into a powerful, original theory. …Three men in a row boat. Hutton was soon a member of the Edinburgh Scottish Enlightenment, introduced to Adam Smith and others by Joseph Black. Hutton, Black and Smith founded a club known as the Oyster Club, one of the literati clubs that were a feature of Edinburgh during the Scottish Enlightenment and when the Royal Society of Edinburgh was founded by royal charter in 1783 Hutton, Black and Smith were three of its first members. Sometime in 1784 Hutton was invited to present two lectures to the Royal Society on his theory of the earth. Two more successful field trips, to Galway and Arran provided additional evidence of Hutton’s theory. Then the eureka discovery, the boat trip to Siccar Point and evidence that the earth’s formation is a cyclical event! On a sunny afternoon in June, 1788, three gentlemen from Edinburgh, with several farm hands as crew, boarded a boat in the North Sea, east of Edinburgh, in search of a rock outcrop on the rugged cliffs along the coast that would support James Hutton’s theorized cycle of land renewal over long periods of time. The three gentlemen in the boat were Hutton and two friends, professor of mathematics, John Playfair, considered one of the cleverest men in Scotland, and a younger man, Sir James Hall, in his twenties already an accomplished Scientist. Hutton, an animated man, was elated. Here was incontrovertible proof of his theory. Playfair was less sanguine. As a former Presbyterian minister, he knew how vigorously the church, and scholars who supported it, would protect judgements on which it held a position. The battle for truth was just beginning. Reviews of Hutton’s paper, published in 1788 by the Royal Society, were mostly dismissive of Hutton’s findings, the most hurtful to Hutton by Robert Kirwan, a respected scientist who as a young man trained as a Jesuit priest. Kirwan criticized Hutton for proposing cycles that were contrary to reason and accused him of blasphemy. Hutton responded by starting work on a two volume book, though he was seriously ill at the time. His ‘Theory of the Earth’ was published in 1795 and Hutton died soon afterwards. The book was not well written and criticisms of Hutton’s theory continued, particularly attacks by a young man from Edinburgh, Robert Jamieson, who published prolifically, applying a viewpoint to Scottish geology promoted by Frederic Werner, a professor from a famous German university. Werner argued that a universal ocean, once covered the earth, creating the chaotic formations of the earth that now existed, a theory more acceptable to established religion by its reference to Noah’s flood than Hutton’s theory. Hutton’s theory was being dismissed, who would begin a counter attack? Joseph Black and John Clerk no longer had the energy. Playfair and Hall took up the challenge. Playfair rewrote the book with distillations of Hutton’s theory and notes and case studies and published it in 1802. Hall carried out over 500 experiments refuting Werner’s argument that basalt when heated always cools as glass. Hall showed that when cooled slowly basalt re-forms as crystals. Despite these efforts Jamieson’s publications were winning out, but then, after the death of Playfair, Hutton’s leading expositor, in 1824 the now elderly James Hall invited Charles Lyell, a young geologist, to Hall’s estate and took him to Siccar Point. Siccar Point worked its magic. Charles Lyell became converted to Hutton’s theory and began carrying out his own field investigations. In 1830 Lyell published the first volume of his ‘Principles of Geology,’ followed by two more volumes in the next three years. Lyell’s book, in which he acknowledged his debt to Hutton, was to become the standard reference for geology students for the next hundred years. Darwin took a copy of Lyell’s ‘Principles of Geology’ with him on his voyage on the Beagle. A week or so after Darwin started reading Lyell’s work, The Beagle dropped anchor at its first port of call, Porto Praya on the volcanic island of St Jago, where Darwin discovered a white stratum of fossilized shells and coral on a hill thirty feet above sea level. (‘The Voyage of the Beagle.’ Ch1.) From that that day on Darwin viewed the world by a different time perspective. Darwin’s Voyage on the Beagle. When Darwin set of on his five year voyage in 1831, Lyell’s book and the library on the Beagle influenced Darwin’s research from the start. Having the library now available online reveals the sources and inspirations that Darwin read day after day as he swung in his hammock during long sea crossings or as he worked on his specimens at the chart table or under his microscope. Before the Beagle reached a new location, Darwin was able to read the reports of earlier visitors. The scientific questions he found answered and indeed left unanswered in the library were useful to his own encounters as a naturalist. From St Jago Island, continuing its circumnavigation of the globe, the Beagle visited Brazil, Patagonia and the Falkland Islands, sailing through the Straits of Magellan and on to Chile. In Chile, Darwin crossed the Andes into Argentina, From the west coast of South America the Beagle then journeyed to the Galapagos Islands, those fateful islands, and then across the Pacific Ocean to Tahiti, New Zealand and Australia, land of that marsupial oddity, the kangaroo, before returning to England in October, 1836. At each port of call Darwin would collect bags full of specimens, animals, insects, plants and minerals and send them on to England to be analysed. What to make of that great chain of being? On a beach in Bahia Blanca, Darwin comes across the remains of nine fossil quadrupeds and many detached bones embedded on the beach within the space of 200 yards square. To suggest a driver for the process of species transmutation entailed Darwin’s late reading of a forty year old essay by The Reverend Thomas Malthus,’ ‘Essay on the Principle of Population,’ describing the pressures on living things of overpopulation and competition for scarce resources, ergo if a variation like a longer beak gave a competitive advantage, its owner would likely have a better chance to reproduce and pass on the beneficial variation to its offspring. The rest is high drama, Darwin’s twenty page letter from Alfred Wallace with whom Darwin had been corresponding for several years, detailing Wallace’s own theory, almost identical to Darwin’s, the urgent completion of Darwin’s ‘On the Origin of Species by Means of Natural Selection,’ Charles Lyell acting as Darwin’s literary agent, the agreement to publish Wallace’s Paper along with Darwin’s book, allowing joint credit for discovery, Darwin’s anxiety and concern about the book’s reception …well the road to heresy is never easy. And it wasn’t easy for Darwin’s theory of natural selection. There’s that religious indignation for a theory that claims human’s evolved, not as direct descendants of the first Adam, but via a common ancestor we share with monkeys and apes. And there’s the problem of those ‘organs of extreme perfection and complication’ as Darwin describes organs like the intricate human eye and the even more powerful eagle eye. Surely, creationists argued, eyes must be an example of creative design. The claim of shared ancestry in Darwin’s Origin of Species provoked furor from orthodox Christians of all denominations and gave cartoonists a field day. The historic Oxford Debate, ‘Evolution versus Creationism,’ between Bishop Samuel Wilberforce and Thomas Huxley, Darwin was ill and unable to attend, in which both Huxley and Wilberforce claimed victory, was a theatrical event. Wilberforce, nicknamed ‘Soapy’ Wilberforce, criticized Darwin’s theory, its assumptions, and its moral implications, concluding with a sarcastic question, asking Huxley, nicknamed ‘Darwin’s Bulldog,’ if he considered himself descended from an ape through his grandmother or grandfather? According to reports, Huxley replied that while man has no reason to be ashamed of having an ape for his grandfather, if there were an ancestor whom Huxley should feel shame in recalling, it would be the man of intellect who distracts his audience from a real argument by aimless rhetoric and appeals to religious prejudice… In short, Huxley preferred the disgrace of the ape to the ignorance of his opponent. At this dramatic juncture, a lady in the audience is said to have fainted and was carried out of the lecture hall. Less controversy today regarding man’s descent. Scientists have now sequenced the genes of the chimpanzee and found the human genome is 96 percent similar to the great ape species. ‘Why has man not a microscopic eye?’ … Questions, questions. ‘Why hast man not a microscopic eye? / For this plain reason, Man is not a Fly,’ says Alexander Pope. Ask not why man’s eye is what it is, as Pope asked in ‘An Essay on Man,’ but ask instead how it came to be what it is. Writing to a colleague in 1860, Darwin confided that there was a time when thinking about the evolution of the complex eye, made him ‘cold all over.’ Darwin devotes a chapter, in ‘The Origin of Species’ to the difficulties of descent with modification of those organs of extreme perfection like the intricate human eye. From examples in nature, Darwin demonstrated that over a long period, a complex human eye can evolve from the simple-light sensitive nerves of the lowest organisms, to a basic eye, consisting of an optic nerve surrounded by pigment cells and covered with translucent skin and on to more sophisticated vision. Darwin also argued that a complex organ, like the human eye, can even evolve by adaptation of an organ from one purpose to another, as the floatation swim bladder of fish converted to lungs for respiration. More of this anon…So much fascinating stuff written about the evolution of the eye, but too much for this essay, so I think I’ll do a follow up post on it instead. A little Deux Ex Machina. Before I offer Darwin’s concluding words in The Origin of Species, some serf thoughts, deux ex machina, on heretical thought. Seems that the birth of science, like Darwin’s theory itself, is a complex evolution involving sea journeys that challenged old certainties, and a rediscovery of the thoughts of philosophers of the Greek Revolution. ‘All things are made of water,’ said Thales of Miletus, and so began philosophy and science… There’s Pythagoras’ school that gave rise to a mathematical tradition and Aristarchus of Samos proposing a heliocentric theory pre Copernicus. A marginal entry of the name of Aristarchus on one of Copernicus’ manuscripts shows that Copernicus has resuscitated this theory. And there’s the Church’s part in the above. After the destruction of the Roman Empire by northern invaders, literacy and the study of mathematics in the West came to be almost exclusively maintained by the Catholic Church. In Europe, in the Middle Ages, it was the clerics copying the manuscripts of Greek and Middle Eastern scholars who kept learning alive. Arising out of the Christian Church, even with its adherence to dogma and its Inquisition, you get an attachment to reason and consequent breakthroughs in understanding natural phenomena by church clerics like Copernicus and by devout members of Christian communities… there’s Galileo, Isaac Newton, who spent much of his time in bible studies, James Hutton and his supporter, chemist Joseph Black, a Presbyterian Minister, not infidels or atheists but Christians. Don’t know if Darwin believed in a divinity acting behind the scenes. Some of us serfs are doubtful regarding a creator, but we do stand in awe of the grandeur of nature, ‘the wild cataract leaps in glory,’ well, you know… Maybe Darwin was agnostic but we really don’t know.